Service Dog and Therapy Dog Training. Leashes for Living is a unique program that teaches Veterans and Persons with disabilities to train their own service dog. Through positive training techniques, the student/handler learns how to communicate with their canine partner. By teaching their dog special skills and manners, the student is capable of achieving an enhanced lifestyle. We teach you to train your dog as a Therapy dog for visitations to hospitals, schools, and nursing homes. See how your dog's visit can bring a smile, improve a person's quality of life and leave a warm spot on their heart. Leashes for Living Assistance Dog School, Inc.
An Arizona nonprofit & Federal 501(c)(3) Public Charity Organization. And so much more!! We teach you how to train your service dog. The skills your dog can learn from you through us is limited only by your imagination. Dogs love to learn and we love to teach! What a great combination! Dogs speak to us everyday, we just need to listen. We teach you to listen to what your dog has to say. Through body language your dog tells you everything you need to know to make life with a canine the best! 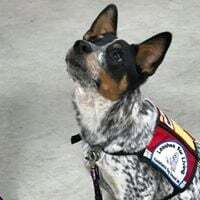 Service Dogs are animals that are individually trained to perform tasks for persons with disabilities such as alerting people that are deaf, pulling wheelchairs, alerting and protecting a person who is having a seizure, turn on lights, open doors, get help, or perform specific tasks for individuals suffering from psychiatric disorders. The dog is individually trained to help a person with disabilities to enhance their lives, improve their activities of daily living, and improve their independence. Service dogs are working dogs and NOT Pets. Under the Americans with Disability Act businesses and organizations that serve the public must allow people with disabilities to bring their service animal into all areas of the facility where customers are normally allowed to go. Refusal to provide equal access is a federal civil rights violation and violators can be required to pay monetary damages & penalties. Therapy dogs are not service dogs and do not fall under the ADA Laws. 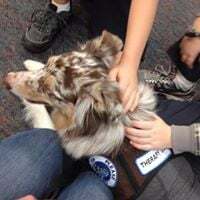 The dogs are trained to provide affection, entertainment and comfort to individuals in such places as VA & other hospitals, support and learning centers, retirement homes, hospices, or schools to provide assistance in reading programs, Therapy Dogs are also finding their way into courtrooms to provide comfort, as well as providing comfort to disasters victims. The dogs must love being handled in a variety of ways & environments, overcome many sounds & erratic movements, handle a variety of smells & odors, be comfortable around wheelchairs, cane, crutches, walkers and other adaptive equipment. A visit from a Therapy Dog demonstrates a calmness, happiness, and overall emotional feeling of well-being in the patients they visit. Therapy dogs have been known to lower high blood pressure and enhance recovery in patients they visit. They play a vital role in the special needs community.